and Poppa E practice in Maakah's tiny Waimanalo apartment. ANY musicians play reggae music in Hawaii for fun and profit. THC (also known as The Heartical Crew) is one of the rare reggae bands here that plays the music for a higher purpose. Yes, reggae rhythms are great for dancing, but for THC, the music is first and foremost a means to give thanks and praise to Jah (God). "We consider it our way of life, not an 'ism'," says bassist Isis, explaining the preferred term for his faith is "Rastafari." The quintet -- Isis, Maakah (keyboards), Drummie (drums), Poppa E (keyboards) and Binghi (guitar) -- has been together four years. All five are alumni of Roots Natty Roots, an earlier reggae band, although Binghi and Poppa E joined RNR after the others had moved on. THC is getting national exposure with "Strive," an original song released on John Iervolino's "Roots Music" anthology in May. The song will also be included on an THC album that should be out by early fall. Where: Anna Bannana's, 2440 S. Beretania St.
"Jah brought us together," Poppa E says of the creation of THC. 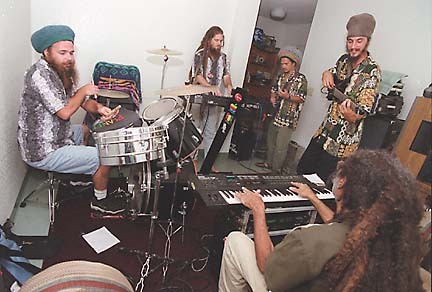 The quintet sometimes performs dressed in white, but more often members wear aloha shirts and white trousers with their crowns (the headgear that contains their dreadlocks). Some wear coins or other medallions bearing portraits of Haile Selassie, the man Rastafarians recognize as the Son of God. THC celebrates the 108th birthday of His Imperial Majesty Haile Selassie at Anna Bannana's tomorrow night. The band's music calls for peace and unity among mankind, and warns of the materialism and moral corruption of the oppressive "Babylon system." The term reflects the Rastafari tenet that just as the children of Israel were taken as slaves to Babylon, so were their ancestors taken from Africa to the New World to labor as slaves in modern Babylon. "We're missionaries and our music is our sermon. 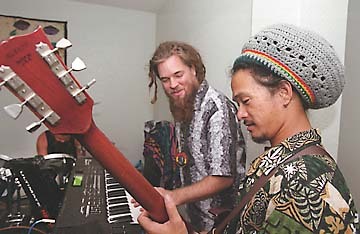 If we were in this for the money, we'd have dropped out long ago," Maakah says of THC's powerful roots-reggae repertoire. Isis believes the message is being heard, explaining Heartical means "heartfelt or coming from the heart." "With time and people hearing more about the truth, I think people are starting to know about who Rastafari is and Haile Selassie I (pronounced "eye"), and realizing the reggae music is more than just Bob Marley and dreadlocks and smoking herb," says Isis. THC's Maakah on keyboards and Binghi T. on guitar. "It has a deeper meaning. What we're dealing with is strictly Biblical from Old Testament times to now. We're dealing with the Revelation times right now, and that's what we sing about. It's the same thing as if you're reading the Bible, but it's easier for people to digest with music." Poppa E and Binghi agree. People come for the music and the party but some hear the message as well. That's one of the reasons THC doesn't mind backing other recording artists, as well as playing its own music. "Since we've been backing some of the local acts, our message has been going further and further into the local population. When you hear the truth, people are going to come out for it," Poppa E says. THC brings an integrity to Hawaii's reggae scene, whether as headliners or when working in tandem with Reality or "Chief Ragga" Jamin Wong. THC can generally be heard at Don Ho's Island Grill, the Pier Bar, Anna Bannana's, Aloha Joe's, Nick's Fishmarket and the new World Cafe. Reggae is a "world music" these days, and THC reflects the cosmopolitan appeal of the music and the message beyond its origins in Jamaica. Binghi is a "local boy." Maakah, Isis and Drummie are European-Americans who came to Hawaii from Southern California. Poppa E is a African-American from Cincinnati. Isis says the message of Rastafari is universal. "Without faith in God we are like a ship without a rudder with no direction. "We are all in one (and) we are all equal, and the best thing is to love and respect one another and everyone's different cultures. What Ras Tafari (Haile Selassie) wanted more than anything is for people to have faith in God. God reveals himself in different ways to different people. Rastafari may not be right for someone else but we know it's the Almighty." In the early days of the "Jawaiian" boom here in the early '90s there was much misinformation about the Rastafari roots of reggae music. Some mistook the red, gold and green Ethiopian flag as the national colors of Jamaica (the Jamaican flag is black, yellow and green). Some performed with Ethiopian flags disrespectfully tied around their necks like capes; others affected Jamaican accents or blurted out "Jah Rastafari" with parrotlike regularity between every song. Some identified Ethiopian emperor Haile Selassie as the "King of Jamaica"; others guessed he was Bob Marley's father. Rastafari is a monotheistic religion that parallels Judaism, Christianity and Islam in its core belief in the existence of a single all-powerful deity. The difference is in the details. Jews believe the Messiah has not yet been revealed. Christians believe the Messiah was and is Jesus Christ, the son of God, whose return will mark the end of the current system on earth. Moslems honor Jesus as a teacher and prophet but recognize Mohammed as the final prophet through whom Allah revealed His will through the Koran. Rastafari teaches that Jesus has already returned in the person of Ras Tafari, generally known to non-Rastafari as Haile Selassie (1891-1976), emperor of Ethiopia. Just as the Japanese imperial family traces its linage back 2659 years to the Emperor Jimmu and from there to Amaterasu Omikami (the Sun Goddess), so is the linage of Haile Selassie traced back to Menelik I, son of King Solomon and the Queen of Sheba, and from there back to King David. Jamaicans studying the Bible saw Haile Selassie as the "Root of David," fulfilling the prophesy of Christ's second coming. Haile Selassie was deposed by a socialist clique in 1974 and was reported to have died (or been murdered) in custody in 1976. Some Rastafari say he did not physically die. Others consider the question irrelevant. "It's a serious thing, Selassie I, we could spend many hours talking about Haile Selassie," THC drummer Drummie explains. "I would say that we actually keep him alive by playing the music that we do and spreading His word, because the word represents what he represented. He is always in our heart and in our soul," adds THC guitarist Binghi. THE most visible sign of an observant Rastafari are his dreadlocks, a long tangled braid-like hairstyle often compared to a lion's mane. Isis, from the band THC, said dreadlocks are worn in keeping with Biblical scripture to "let the locks on your head and your beard grow," a teaching also observed by some in the Jewish and Moslem faith. 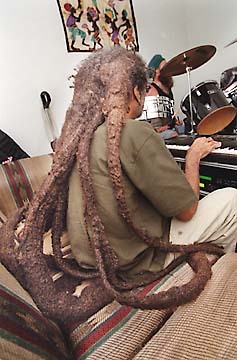 THC keyboardist Poppa E describes his dreads as "antenna to the world." All five band members say they wash their dreads frequently. "(We) use plenty of shampoo, a big bucket, and lots of essential oils to make 'em smell pretty," keyboardist Maakah explains. "You see a lot of people these days with dreads as a fashion statement who aren't really into the serious aspects, but it's a serious thing to wear dreads. You wash 'em and they take care of themselves, but you go through a lot (wearing them)," Poppa E says. Maakah said long dreadlocks and the colorful oversize "crowns" are one way for Rastafarians to quietly demonstrate their unwavering commitment in Jah. "As they get longer you can't hide 'em. The more your locks grow the more you feel the prejudices, but your covenant is strong," he said. All five band members have lived on the mainland and agree Hawaii is more tolerant of dreadlock wearers. "On the mainland it's touch-and-go, but people here love to see the rastaman coming. There's a lot of love here, a lot of different people, but a lot of people coming together. That's how we all ended up here. We've found something here, an acceptance," said Poppa E.